Dermal fillers are a lifting and reshaping treatment that is achieved through an injectable treatment. An example of treatment areas include lifting lines such as nasolabial (nose to mouth lines) and marionette lines (sad mouth corners and jowls), lifting depressions in the skin caused by scarring (such as acne scarring, trauma, accidents or cleft lip), and lifting regions on the face due to fat loss and aging (such as the upper and lower cheeks, temples, and brows). Please note that all of the prices are simply a guide. The volume required and the type of filler required varies from client to client, so feel free to come in for a FREE consultation and Skin Assessment (using our Skin Scanner) to get an accurate quote. * Clear pricing is giving on assessment and will vary according to wrinkle depth and surrounding facial volume. Quite often a client may come in asking for nose to mouth lines and leaving with several options that will give their overall appearance, a more youthful result. The treatment time is typically 30 minutes long. You will also want to allow 60 minutes for an assessment and application of the topical anaesthetic, plus your treatment time. Your medical history will be reviewed prior to undergoing any treatments to check for suitability. 5. Making your 2 week follow up (Anti Wrinkle Treatment and Lip fillers only). You are invited back for a filler review, but this it isn’t a requirement. Is it safe? Dermal fillers are man-made and so the likelihood of allergic reactions and virtually non-existent. Gone are the days of animal based fillers where a test patch was necessary to test for reactions. Does it hurt? We use topical anaesthetics that are very effective when applied for the correct length of time. Some dermal fillers also contain a local anaesthetic for improved pain relief. Some areas like the lips warrant an injecatble anaesthetic like you would receive at the dentist, so this will be offered as part of your treatment at no extra charge. How long does it take? You will need to allocate 60 minutes to allow time for both the topical anaesthetic, assessment and the treatment itself. Your 2 week review will only take 10 minutes should you need one. How much does it cost? Syringes cost from £150 – £700 per syringe, depending on the treatment area, the volume required and the longevity of the dermal filler. Your expectations of the type of result you would like, will determine the number of syringes that we use or would recommend. Check out our offers page for additional offers that we give away FREE at various times of the year. You will be given an accurate price during your consultation as part of our pricing guarantee. We encourage our customers to have a consultation, and take the time to consider the pricing and the treatment prior to having the treatment at a later date. How does it work? Dermal Fillers basically lift and plump the skin. As the hyaluronic acid is also hydrophilic, it will further hydrate by drawing water to the area. How long does it last? This depends on the type of filler used. For example the thinner fillers won’t last as long as the thicker fillers. As there are 9 varieties in viscosities, this varies from 2 months to 18 months, but these time frames also vary from person to person. How will my skin look? Initially the skin will look red and raised for the first day. This can rapidly disappear after an hour on some clients but last the full day on others. The level of lift given by the filler will be seen immediately after the treatment, although it will start to hydrate afterwards. What are the side effects? Common side effects are associated with skin trauma caused by the needle, which are tenderness, swelling and bruising. Bruising is more susceptible around the marrionette lines and the lower cheeks. Other side effects include the risk of infection, and the risk of a block vessel. Both of which can be rectified should they occur, by our medically qualified staff. 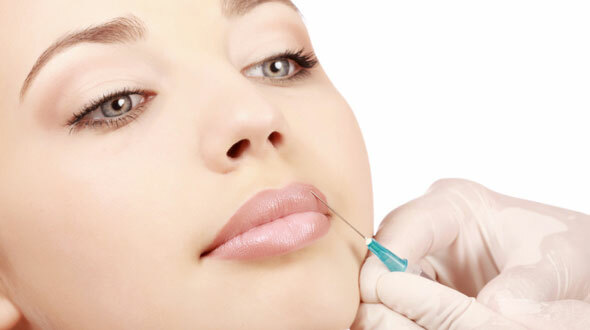 What should I look out for in the different brands of dermal fillers that clinics are offering? As dermal fillers are unregulated, it’s important that you receive dermal fillers that have been on the market for many years with a good safety record and clinical papers to support them. Check to ensure the dermal fillers are temporary too. What are dermal fillers? Dermal fillers are man made products that are used to fill the skin. There are many types of dermal fillers from temporary to permanent. We use the temporary hyaluronic acid dermal fillers, however, longer term temporary products are also available.